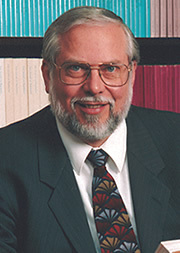 As Senior Associate Dean for Program Development, Ronald Hansen was responsible for Simon’s international program development, undergraduate program and involved in the Technical Entrepreneurship And Management (TEAM) MS and the Technical Entrepreneurship and Management in Biomanufacturing and Therapeutic Development (TEAM-BMTD) programs. He served as area coordinator for the concentrations of Business Environment and Public Policy, Health Sciences Management and International Management. Prior to this position, Ron served as Senior Associate Dean for Faculty and Research for 21 years. He came to the School in 1971 as an assistant professor and became director of the Systems Analysis Program in 1972. From 1977 to 1986, he was the associate director of the Center for Research in Government Policy and Business, now the Bradley Policy Research Center. He briefly left the Simon School to become the first recipient of the Merrell Dow Professorship of Pharmaceutical Administration in the College of Pharmacy at The Ohio State University (1986–88). Hansen is widely recognized for his scholarly research in drug-development policy and in the regulation of the pharmaceutical industry. He helped to establish and collaborates on research with the Tufts Center for the Study of Drug Development. Hansen was on the editorial board of the Journal of Research in Pharmaceutical Economics. He was a member of the National Advisory Council on Health Care Technology Assessment (1985–88) and the Committee on the Children’s Vaccine Initiative, Institute of Medicine, National Academy of Sciences (1992–93). Hansen earned a B.A. degree in mathematics from Northwestern University, and an M.A. degree in economics and a Ph.D. in economics from the University of Chicago. Hansen is widely recognized for his scholarly research in drug-development policy and in the regulation of the pharmaceutical industry. He helped to establish and collaborates on research with the Tufts Center for the Study of Drug Development. Hansen was on the editorial board of the Journal of Research in Pharmaceutical Economics. He was a member of the National Advisory Council on Health Care Technology Assessment (1985–88) and the Committee on the Children’s Vaccine Initiative, Institute of Medicine, National Academy of Sciences (1992–93). Comments on the proposed change in FDA’s trade secrets policy. Resubmitted to JHE in June 2015; Accepted for publication for May 2016.